Meet Mabel, a whip-smart, impeccably trained, and super stylish poodle and her human, Suzie. Suzie is Workman's publisher and editorial director as well as an absolute dog lover. 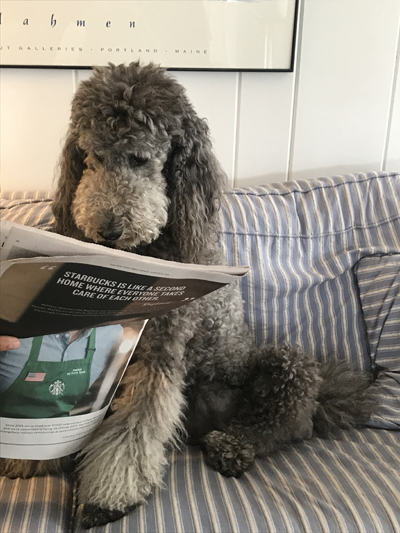 Enjoy our interview with Mabel, and don't forget to submit your pet's photo in the Page-A-Day photo contest for a chance to have your pet featured in our calendars! We met when I was about a month old. My birthday is June 5—I am such a Gemini, you don't even know—so it was a hot summer day. I was out on the grass with my dog mom and sibs when I saw her coming. I scrambled over the rest of the litter to get to her, because I knew I wanted her to pick me. And because I was the runt, I had to try a little harder. I really didn’t have to bother, though—you may not have noticed, but she’s kind of short herself [editor's note: Suzie is 5 feet tall]. I’ve learned that she doesn’t judge people, or animals, by their stature. Do you know any tricks? You appear to be very fit. Will you share your diet and exercise regimen? #1 I eat only when I’m hungry. #2 I look soulfully at my humans until they let me off leash (shhh, they’re not supposed to do that) so that I can run round and round in enormous circles. #3 I get plenty of sleep. I’m good at that. Many things. But I am really proud of the way in which I greet my humans when they come home. I’m super good at that. 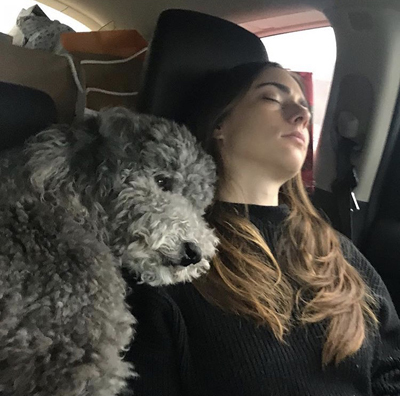 Pictured here: Mabel gets very sleepy in the car, but not as sleepy as Suzie's new daughter-in-law, Jessie.